Sine 1997, the Thurber Prize — named for New Yorker cartoonist James Thurber — has been the United States' only award for humor writing, and it has only ever been given to men. Things are about to change, however, because all three 2015 Thurber Prize finalists are women, and they're all over the age of 50. So now we can drive the last nail into the coffin of the old sexist trope, because women are definitely funny. Progress has been slow for Thurber. The first woman to make the Thurber Prize shortlist was Firoozeh Dumas, author of Funny in Farsi, in 2005. The next woman to make the cut was Patricia Marx in 2008. Finalist groups in 2009 and 2010 each included two women, and the all-female 2015 shortlist is the only time two or more women have come up for the award since. In fact, finalists for 2011 and 2013 were all-beef, leaving many of us to wonder who cut the cheesecake. See, I'm not funny, at least not on paper. In person, I'm... still not really funny. 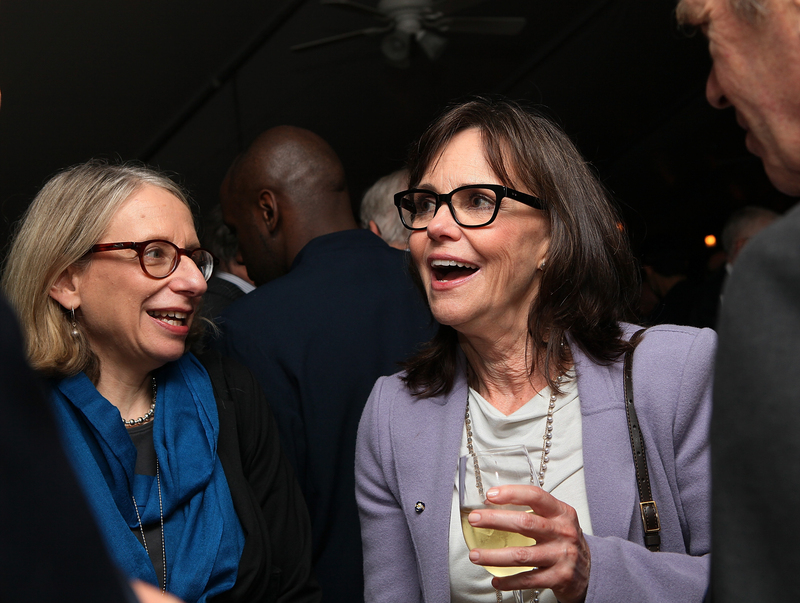 But a lot of women are, including this year's Thurber Prize finalists: Roz Chast (shown above with Sally Field), Annabelle Gurwitch, and Julie Schumacher. Unfortunately, female humorists do not often get the respect they deserve. Remember when Brian Lowry criticized Sarah Silverman for "being as dirty as the boys" in a 2013 Variety piece? Or how about when Andrew Goldman of The New York Times asked Whitney Cummings if she used sexual favors to advance her career? Then there was the time The Man Show's Adam Corolla laid out this nugget in a pile of supposedly funny racism, sexism, classism, and homophobia: "The reason why you know more funny dudes than funny chicks is that dudes are funnier than chicks." And let's not forget that, just this month, the cast of the Ghostbusters reboot visited hospitalized children, only to get slammed by male fans who flooded the hospital's Facebook page with hate. Really, I wish I was making all of this up. The truth is, anyone who has ever watched — or read — anything from Tina Fey, or Amy Sedaris, or Jenny Slate knows that women are funny. But there's some kind of pervasive set of myths and tropes still floating around in the ether that say women aren't supposed to curse or make people laugh, that women's experiences can only be funny when they're being derided. This year's Thurber Prize finalists have given us cause to celebrate. Not only are they all women, but they're all older than 50, which, as we all know, means they're way past their expiration dates. So if you're a funny lady, you can easily flip off the He-Man Woman Haters Club, because even the most prestigious humor awards know: women are f*cking funny.